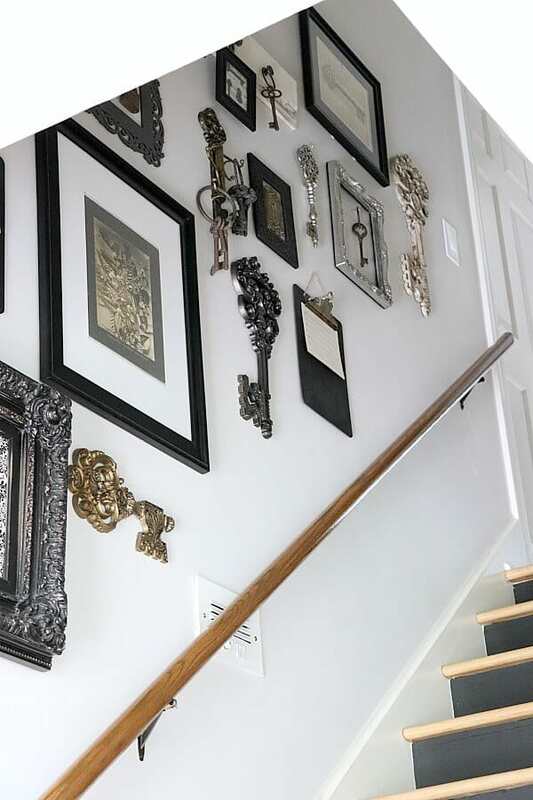 An Easy Staircase Makeover is surprisingly possible in just one weekend. Check out how we did it and you”ll soon see why! Do you ever look at something long enough that makes you want to change it? That’s what eventually happened to me and my staircase. In this case, it all started with my clock. I’m always glancing at my Stairway Gallery Wall when I check the time. So I guess seeing the same thing over and over became ho-hum. In other words, it doesn’t sit well with my redecorranging self! 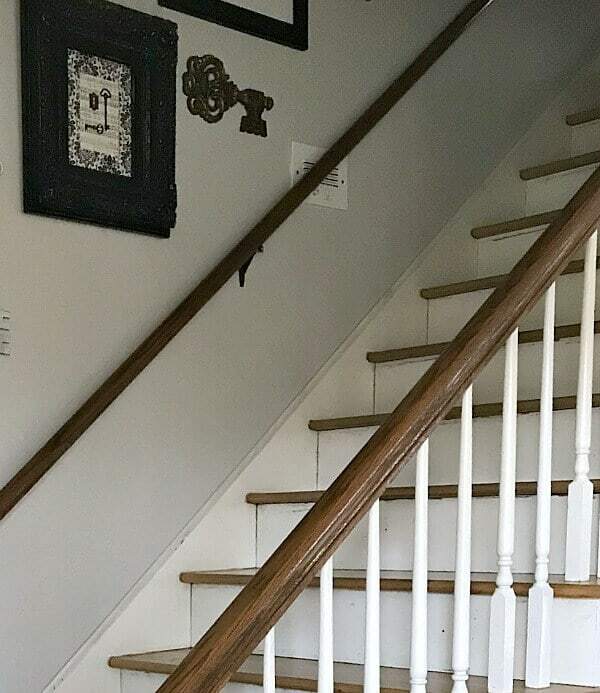 Here’s how this Easy Staircase Makeover looked before. I loved seeing my boys’ sweet baby faces, but as they have grown, they started to get embarrassed of having their photos on display when friends came over, especially that many photos. Indeed it was kind of shrine-esque, I’ll admit. So, it was time for a change! Funny how I hate changes in my personal life, but love to switch things up almost daily in my home. Above all, the main thing I needed to makeover were my stair risers. When we first moved in, we removed our carpet covered stairs, but never repainted the risers because other projects undoubtedly took priority. 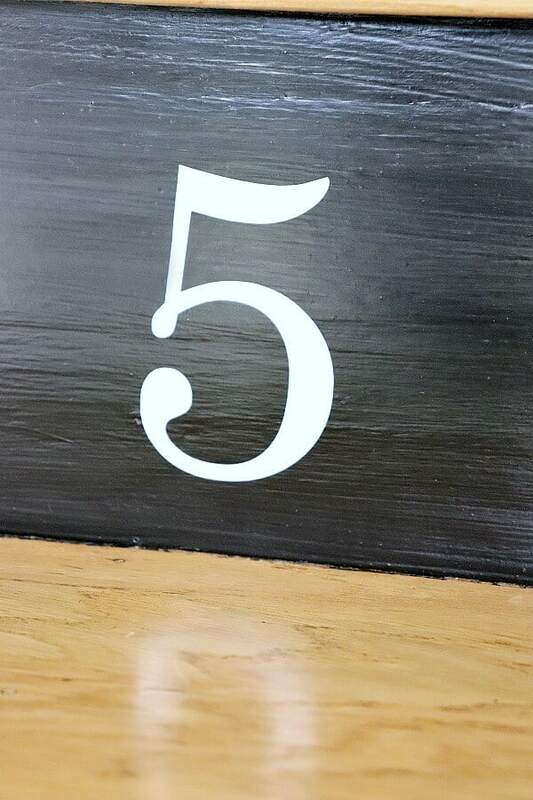 But then when I saw my friends Kristy and Kelsey’s numbered stairs – inspiration struck! Kristy and Kelsey are the mother – daughter duo behind the shop ‘The Painted Nest‘ where they sell their gorgeous handcrafted signs and stencils. I previously worked with them when I updated my Farmhouse Kitchen Island stools and I love how easy their product is to work with. 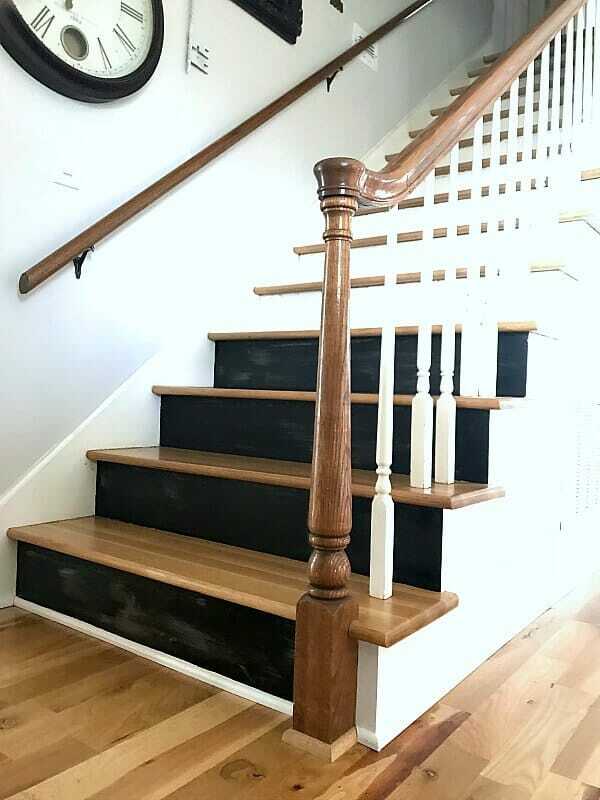 Today – I teaming up with them again for this project and of course I had to share this simple tutorial with you for my Easy Staircase Makeover. To begin with, I painted the risers of my stairs. 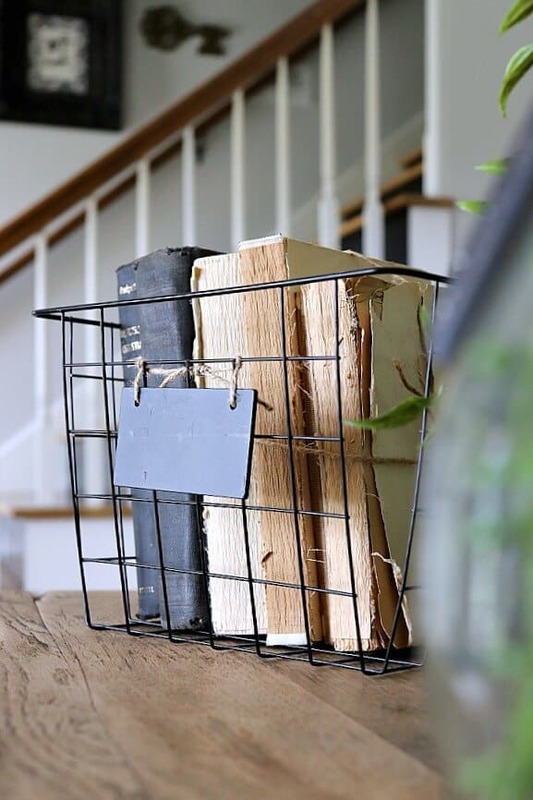 Particularly, I wanted a muted look and tried to achieve that using chalkboard paint. Until my son’s large ski-of-a-foot walked up the stairs, scratching the risers. And then I remembered. Every piece of trim in this house is painted with oil paint, including these risers, which means you have to cover oil with oil. So if you want to do a lot of prep to make the oil surfaces latex-paintable – it is doable. But this momma don’t have time for that! Since I had black oil on hand, my budget-minded self was happy to save the money using what I had, even though it was not sheen I originally wanted. 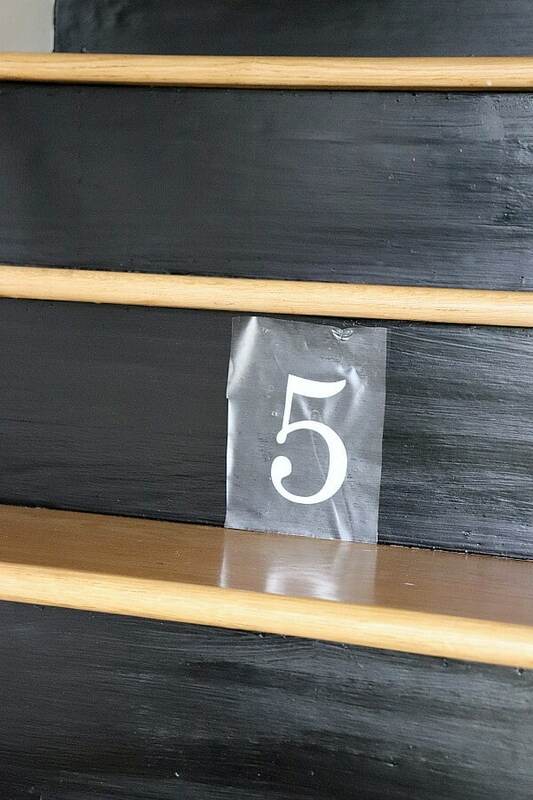 So now my stairs were finally prepped, ready to add the finishing touch – the vinyl numbers! Here’s how to do it! 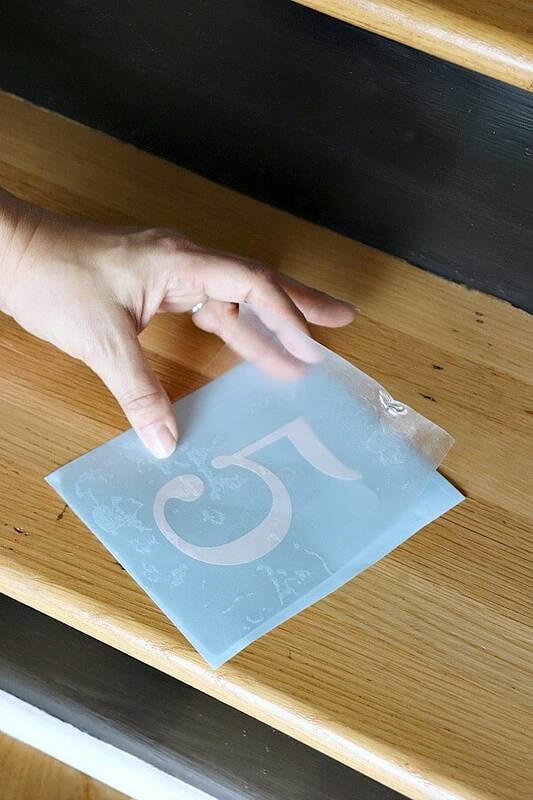 The vinyl numbers come in 2 workable options – either as stencils or as vinyl transfers, which is the application I’m using. 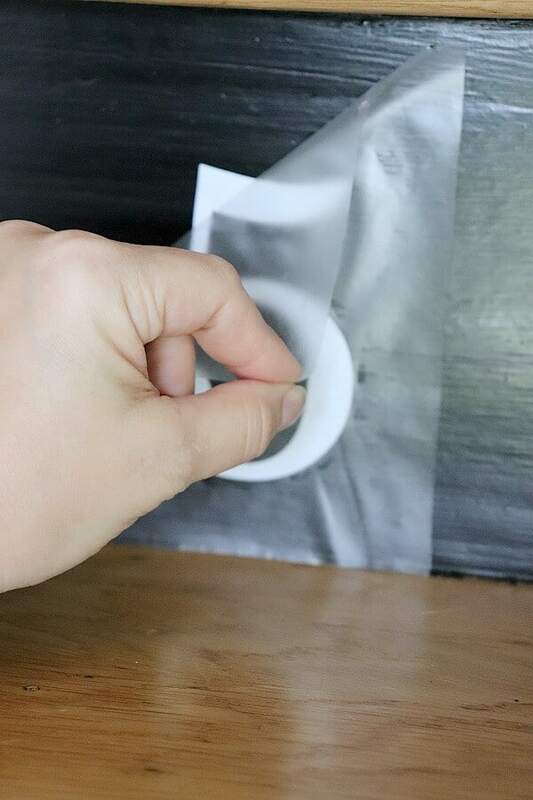 First, you remove the outer trim, leaving just the number on the paper. *Note: You would do the opposite if you were using this as a stencil. 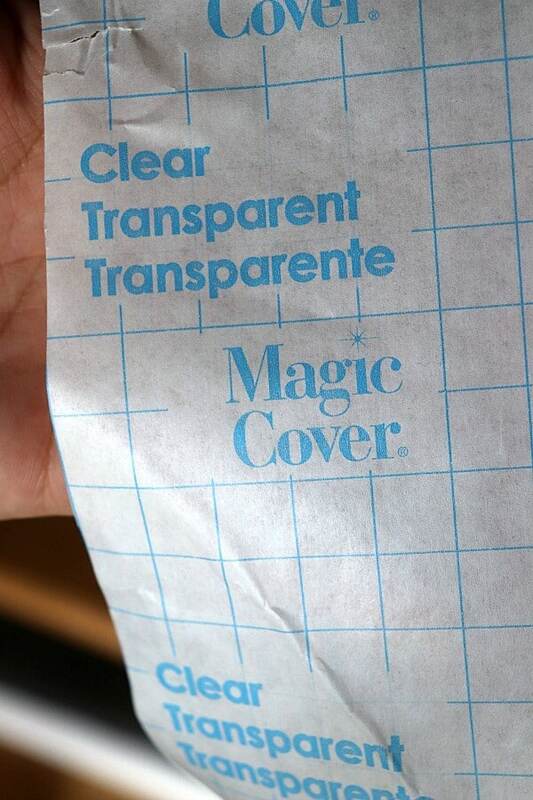 Included with their product is this magic paper. And let me tell you, it’s undoubtedly magic. I don’t know what kind of juju it’s made of, but I love this stuff – and you’ll see why! 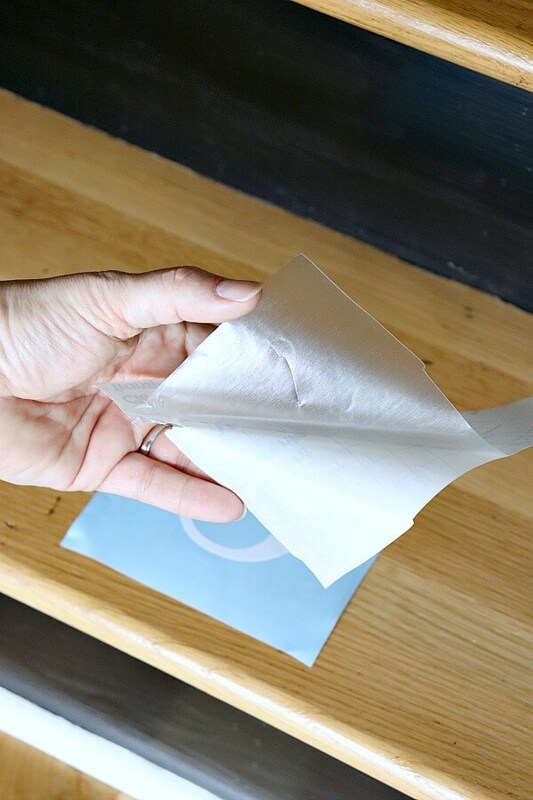 Next, you simply separate the magic paper from its backing. Then you line it up with your number. 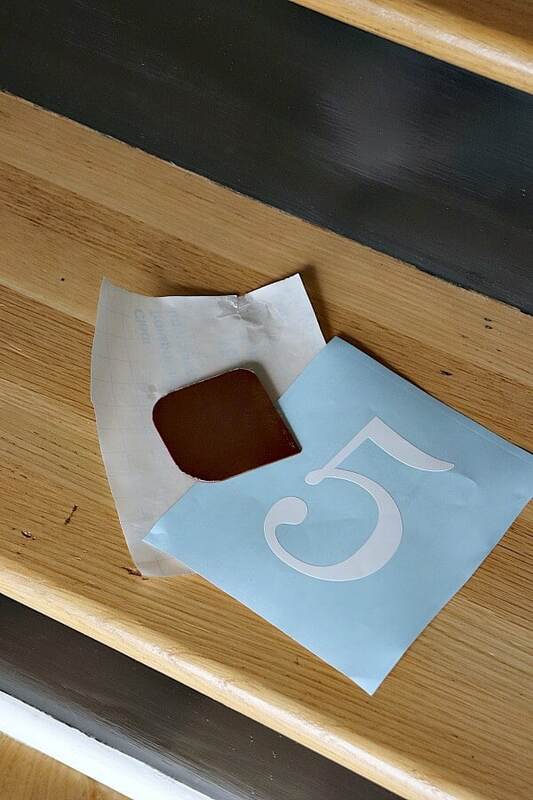 Lightly scratch the magic paper over the number. 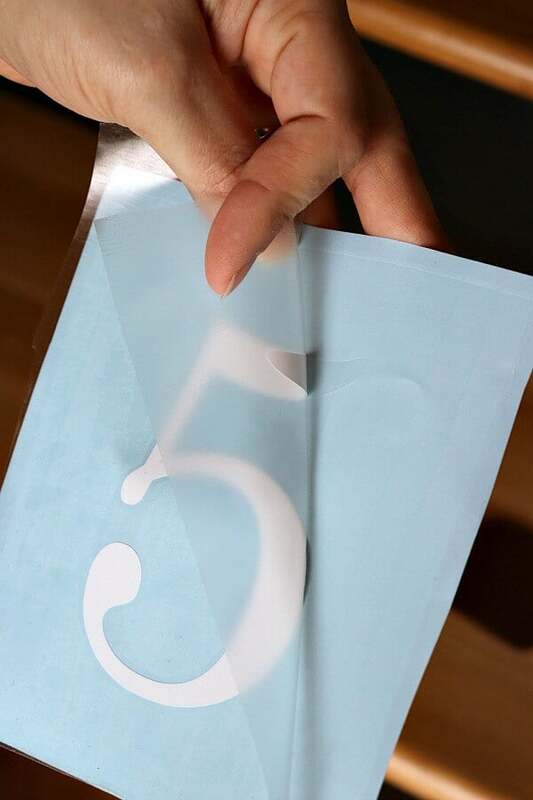 Then carefully peel the paper away, leaving the number on the magic paper. This basically creates a workable transfer for your number. Then you simply line it up and lightly place it where you want it to go. I measured and marked a small tick on each riser so that each number would line up. But here’s where it’s magic – it’s workable and reusable. 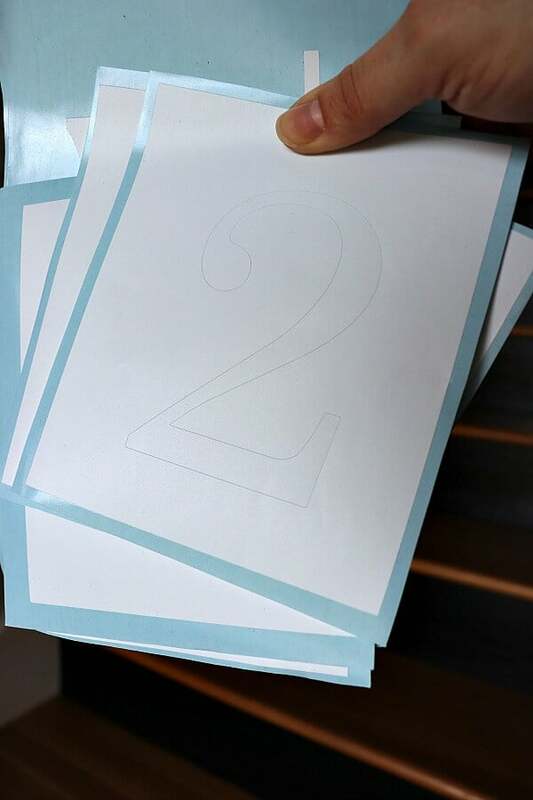 After placing a number or two, I would take a step back and adjust to the left or the right as needed and the number stayed on the magic paper until it was time to transfer. Once I had my number ‘locked in place’ I used my handy dandy scraper and lightly rubbed the number on the riser. 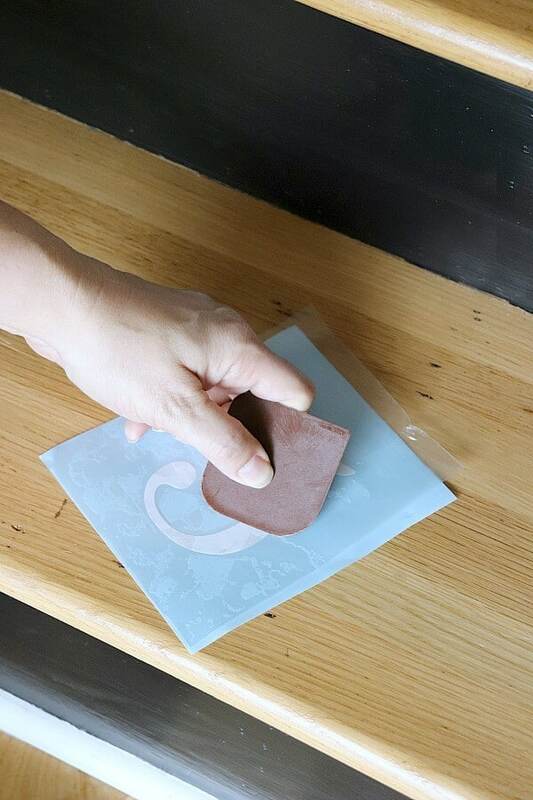 After that, carefully peel the magic paper away and it stays! 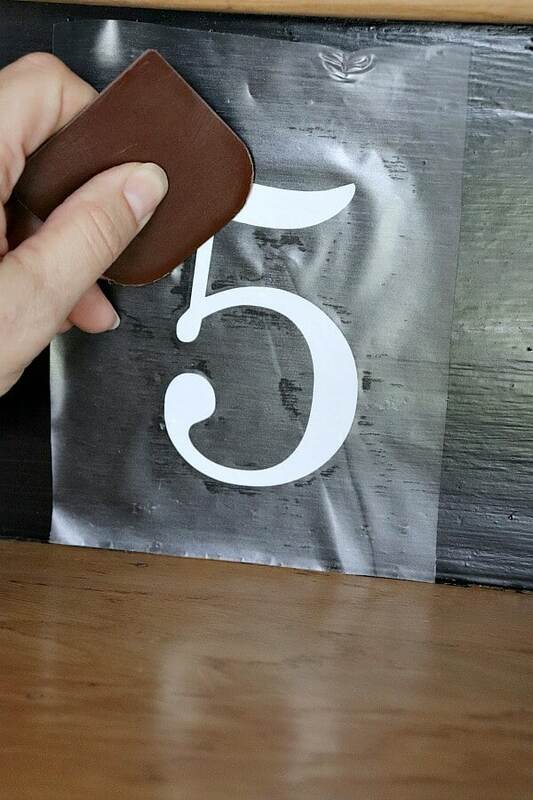 However, if your number didn’t adhere completely, rub the vinyl very lightly in the places needed. Then just repeat each step with the other numbers. Another magic thing about this paper is the reusability factor. One piece almost completed the entire staircase. 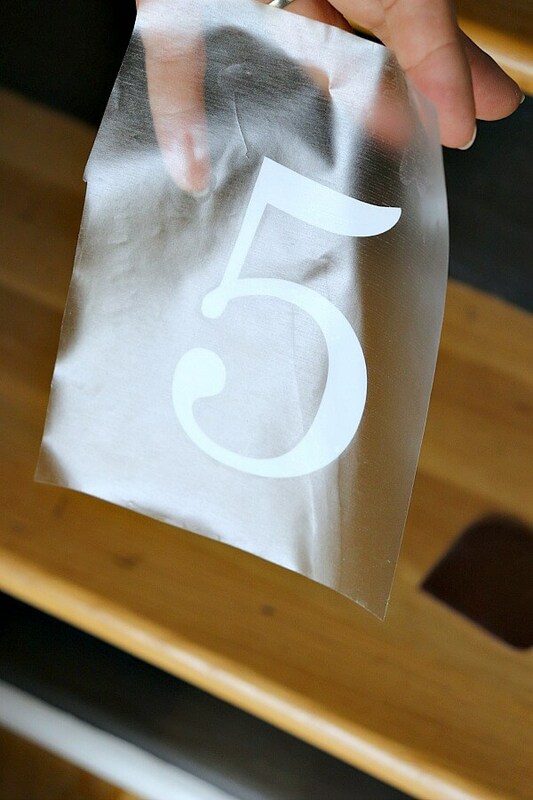 I used the same piece of transfer paper for 8 numbers! And look at the end result!!! Ooh -wee! That gets me so excited! 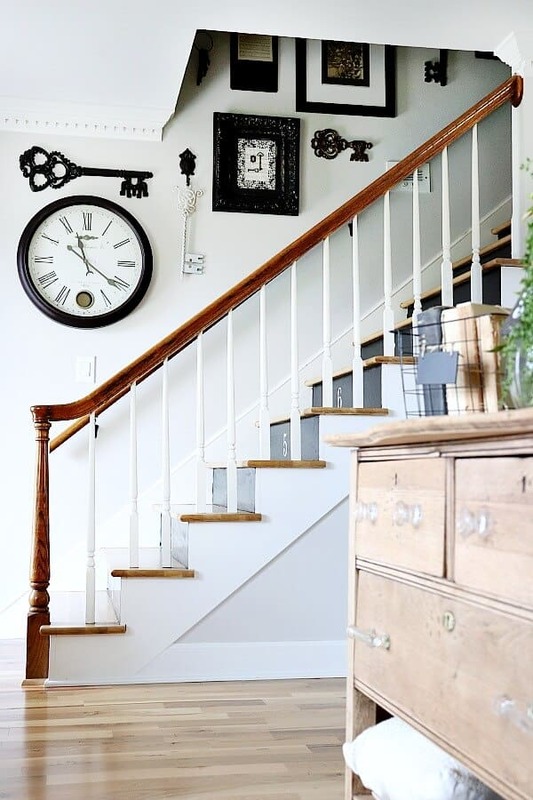 Of course, I love how fast this easy staircase makeover was! Obviously, if I didn’t have to repaint the stairs, this would have been done in a day! But I wasn’t finished there. I still had the gallery wall to update. 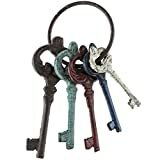 I have a thing for keys and old locks. In fact, I have accumulated quite the collection over the past few years. From keys from estate sales and junkin finds, to some pieces from my family members – which are undoubtedly my fav! One of my favorite pieces is this framed DIY artwork I made years ago. It’s especially precious because it’s from my first voice teacher, my cousin who has passed. It still shows his notes he made and each time I pass it by, I smile. 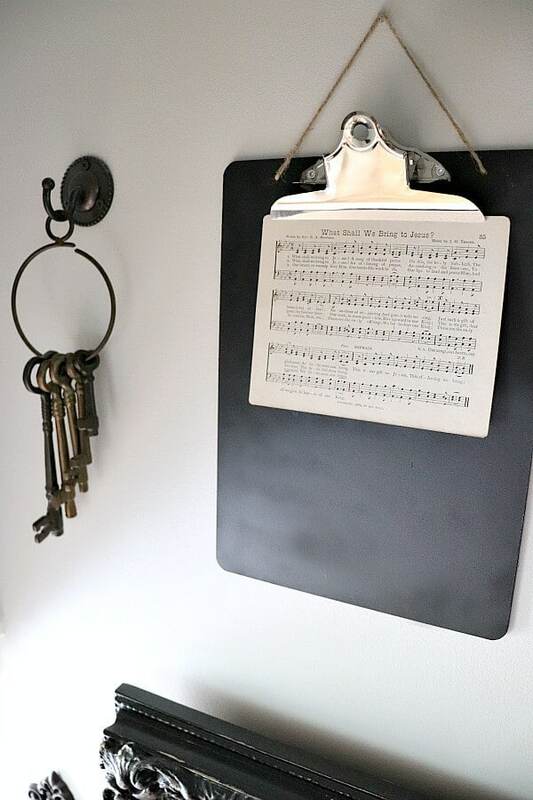 I also included my DIY Clipboard Art frames with vintage music cards. 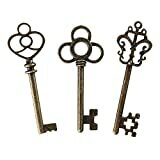 And those keys always hung in my grandma’s house – which I especially treasure! 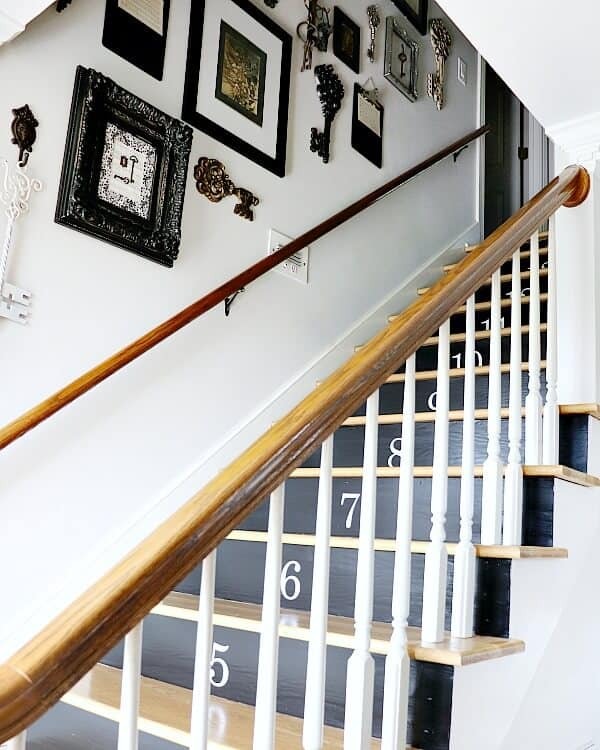 So now my entryway now looks welcoming and amazing with this Easy Stairway Makeover and new gallery wall! Of course, be sure to check out Kelsey and Kristy’s signs and products and visit their online store. You will surely find inspiration there! 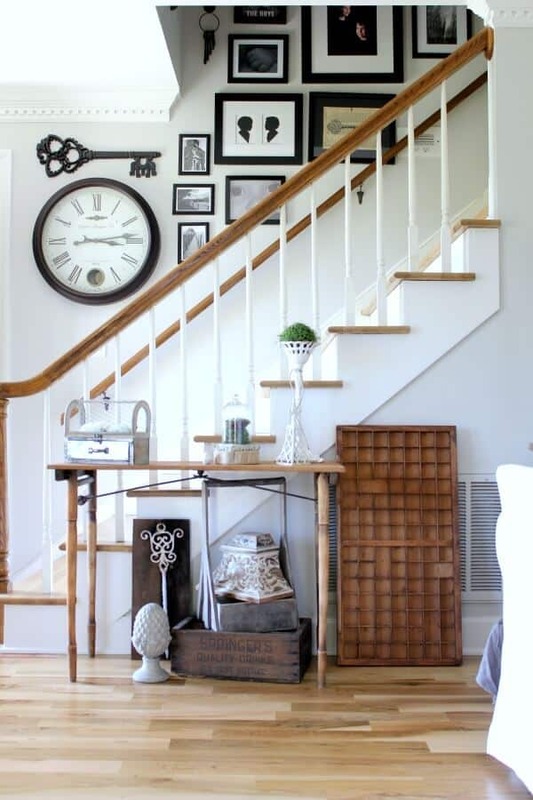 Pin this Easy Stairway Makeover! 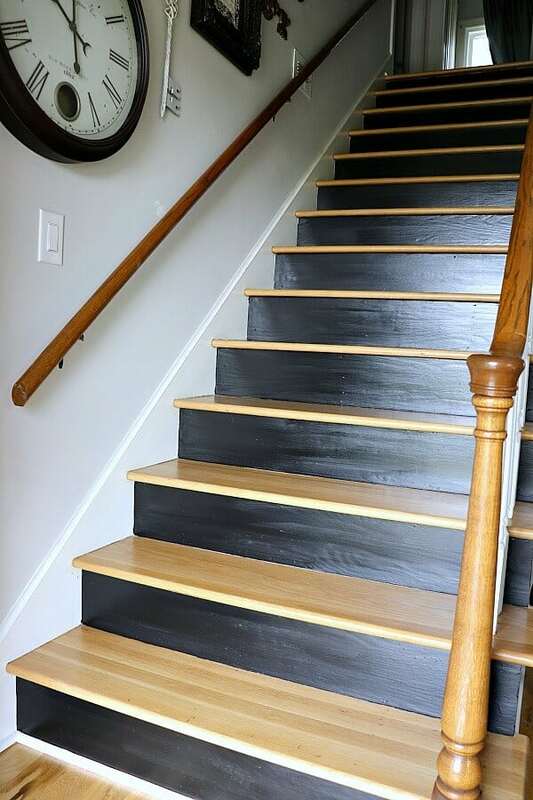 I love the black numbered stair risers. 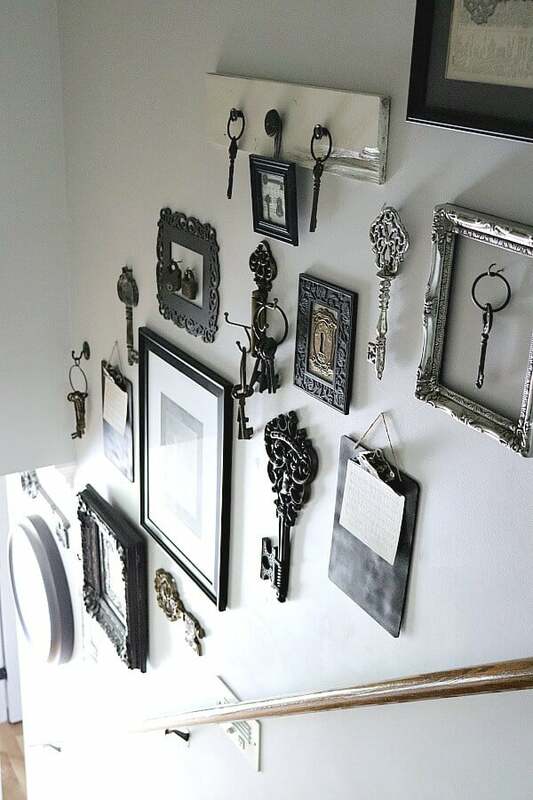 They look so perfect with the key collage display in your stairwell. Great tutorial! Thanks Lisa! It has been a project I’ve been wanting to do for a long time and I’m so happy that I was finally able to tackle it! Thanks for taking the time to comment. It means so much! Hi Roseann! Thank you so much! I love linking up and finding new inspiration each week! Hi! Visiting form the Grandmas House linkup 🙂 This is such an awesome project! I love the way the stairs look with the front painted black, and of course those numbers are so cool! Too cute! It looks great! 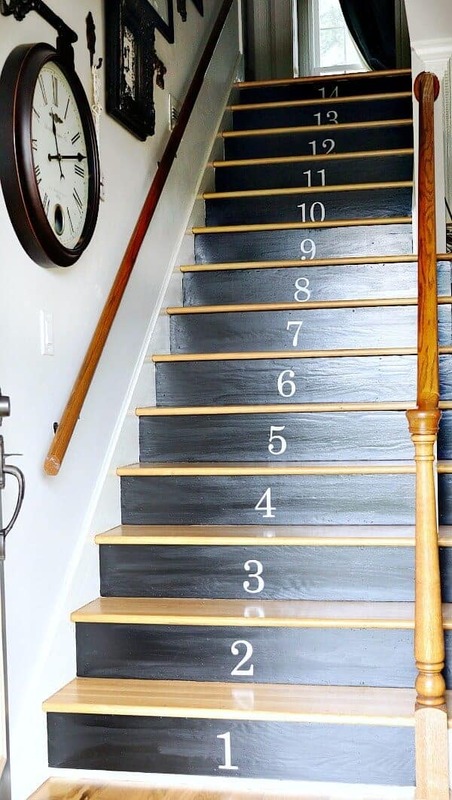 Sadly, I doubt my husband would let me do something similar to our staircase, but I think the numbered steps look really cool. Thank you for sharing at The Really Crafty Link Party this week. Pinned. A beautiful makeover! I am just amazed that you got all the numbers to line up so well! It looks beautiful. Pinned. Aw, Teresa – you can live vicariously through my photos! LOL Thanks for hosting a fun linky! Hi Ashley! Thank you so much for taking the time to comment. It certainly makes my day! 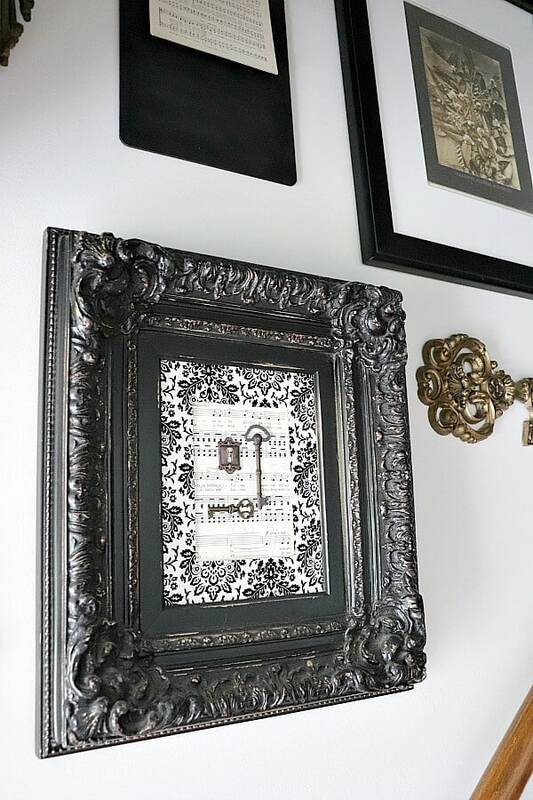 This looks so cool, it really goes so great with the gallery wall and I just love the numbers you added. I thought you used stencils at first, this looks way easier! I love this project, Jen! I’ve been wanting to pull the carpet off of our stairs and do something similar since we moved in (11 years ago). I never would have thought of using vinyl numbers. I would have tried to stencil them and made a mess of it. 🙂 Thanks for the inspiration! I may get to this project yet! I am wanting to tear up my carpet and have wooden stairs. I love this look you have created. Great job and thanks for sharing on To Grandma’s House We Go! Thank you Katrin! I love that The Painted Nest gives you options to use them as stencils or decals! Tiffany! I am so glad this inspired you! 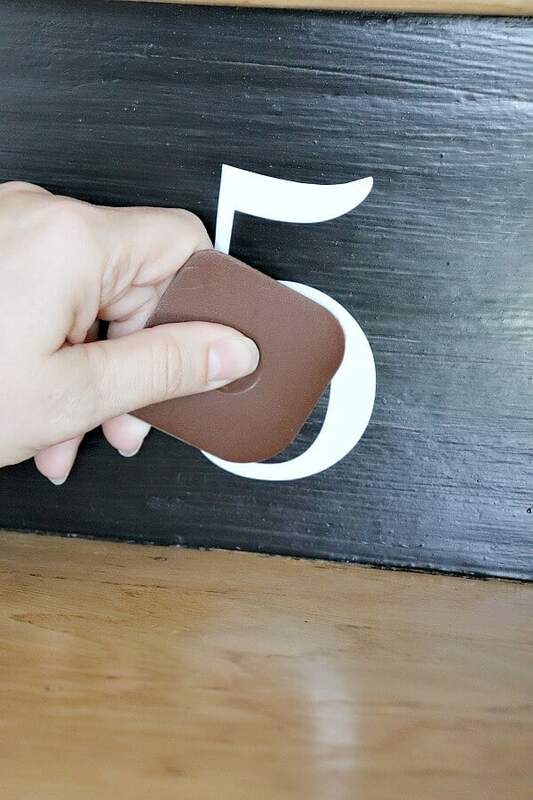 These vinyl numbers are so easy to work with! Hi Chas! I say do it! I’m so glad I finally got around to it! Thanks so much for taking the time to comment Jenna! Honored that this inspired you! Michelle – this was the perfect start to my day today! Thank you so much for honoring me with this feature! That turned out so cute! Thanks for sharing it with us at the Homestead Blog Hop!